The fifteenth is a straight par 4 with OB on the left and trees along the right. One of the widest fairways on the course once you have passed some of the largest trees that reach out for any balls that are left. The only bunker on this hole sits at the front left of the green and protects the toughest pin positions on this green. 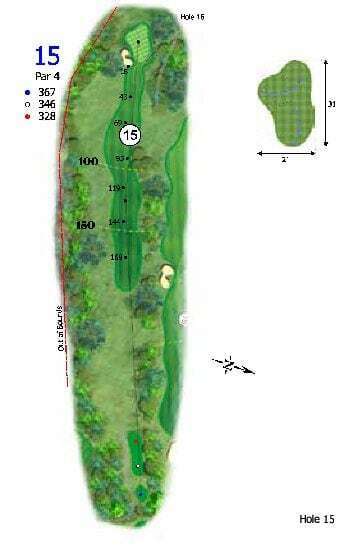 A tough par 4 that will test your accuracy. Safe Play: Accuracy is key on the tee off, play safely down the centre of the fairway with a utility wood to leave a middle iron to a narrow green. A par is a good score on this tough par 4.